RAMSEY, NJ--(Marketwire - September 23, 2010) - Konica Minolta Business Solutions U.S.A., Inc. (Konica Minolta), a leading provider of advanced imaging and networking technologies for the desktop to the print shop, today announces the availability of the bizhub® PRESS C8000, the first system unveiled in Konica Minolta's bizhub PRESS production print product line. Featuring big-iron reliability, world-class color output, and market-leading innovation, the bizhub PRESS C8000 is the ideal alternative to offset presses in the digital era. Combining output speeds of up to 80 pages per minute (ppm) and a 500,000-page monthly duty cycle with a variety of advanced finishing and media handling capabilities, the bizhub PRESS C8000 promises impressive overall productivity for commercial offset and high volume digital environments. 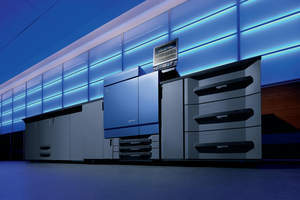 Among the bizhub PRESS C8000's enhanced features are true 1200 x 1200 dpi print resolution; Konica Minolta's Simitri® HD+ color polymerized toner for offset-like image quality; an Image Density Control (IDC) sensor for real-time color adjustments; a new Dual Fusing system to maintain productivity even when running heavy stocks; and a vacuum belt paper feeding system for reliable substrate handling. Additionally, powerful in-line finishing options satisfy the most demanding production print jobs including saddle stitch booklet making, perfect binding, and multi-folding. Driving the bizhub PRESS C8000 is the powerful IC-306 image controller from EFI, featuring the Fiery System 9. The bizhub PRESS C8000 has already been deemed an award-winner for its innovative technologies including a "Best of Show" Award at the 2010 ON DEMAND Conference and Exposition in the Color Digital Printing Equipment category. "The bizhub PRESS C8000 was designed with the print professional in mind. It delivers market-leading innovation in the areas of reliability, quality, and productivity, and raises the bar in the production print industry," said Kevin Kern, Senior Vice President, Marketing, Konica Minolta Business Solutions U.S.A. Inc. "The bizhub PRESS C8000 continues Konica Minolta's long-standing position as a digital imaging innovator, and is further proof how our customers can continue to count on Konica Minolta for all of their printing needs." Click here for more information on the bizhub PRESS C8000. Witness firsthand the bizhub PRESS C8000 at GRAPH EXPO 2010 (October 3 through October 6) at McCormick Place South in Chicago, Illinois. To schedule a personal tour of the Konica Minolta Booth (#2244), reserve a spot at the Konica Minolta Press Conference, and/or an executive interview, please contact Rachel Reed at Rachel.Reed@kmbs.konicaminolta.us. The bizhub PRESS C8000 is available now through Konica Minolta's North American direct sales and authorized dealer sales channels. Konica Minolta is a registered trademark of Konica Minolta Holdings, Inc. bizhub is a registered trademark of Konica Minolta Business Technologies, Inc. Simitri is a registered trademark of Konica Minolta Business Solutions. All other trademarks mentioned in this document are the property of their respective owners.